I’ve been out of sorts lately, too busy to even comb my hair much less blog. Hence, none of the personal cook’s delectable dishes have found their way here. There were quite many in the past two months. I can’t just let this blog die though. After all, the objective has always been to maintain a place to document all of his culinary experiments --- online memories we can someday happily revisit. So here’s one of them. He whipped this up to make me feel better while the responsibilities of life harassed me. 1. 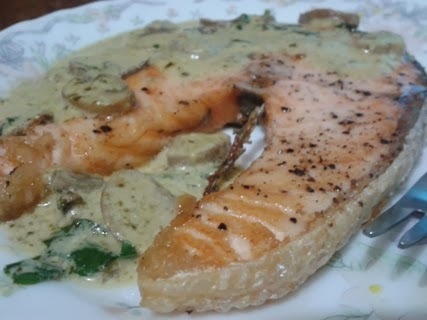 Pat salmon steak dry and season with salt and pepper. 2. Heat 2 tbsps. olive oil in a non stick pan and fry salmon for approximately one minute on each side or until a light brown crust has formed. Remove from heat. 3. Heat the remaining olive oil and sauté the garlic and mushrooms. 4. Add the cream, mixing occasionally for one minute. 5. Mix in the pesto and basil leaves. 6. Remove from heat and pour over salmon. Wife’s Verdict: My mother-in-law would only eat fish if it was fried stiff, so when we were living under her roof, fish always had to be cooked that way. Although I’d eat fish regardless of how it’s prepared (as long as it’s not cooked black as charcoal), I do prefer fish with a little juice in it. This one was just what I needed. Soft, juicy, creamy… yum. I can't wait to have my own kitchen and cook some of these delicious dishes.